We investigated the anti-tumor effect of human interferon-β (HuIFN-β) against malignant melanoma. In vitro study revealed that HuIFN-β not only inhibited proliferation of melanoma cells (seven cell lines: MM-AN, MM-BP, MM-LH, MM-RU, PM-WK, RPM-EP, RPM-MC) but also induced apoptosis in a dose dependent fashion, though the sensitivity to HuIFN-β was different among cell lines. In addition, we administered HuIFN-β into cutaneous metastatic lesions of melanoma and evaluated clinical and histopathological effects. Although the size of the metastatic cutaneous lesion did not change by the intralesional injection of HuIFN-β, histopathological examination revealed apoptotic changes of melanoma cells along with dense lymphohistiocytic infiltration. 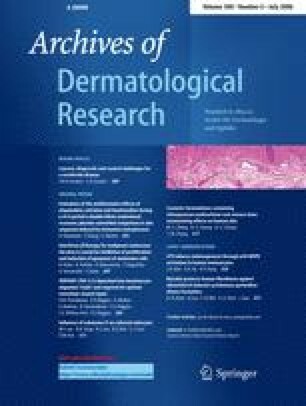 The present study confirmed direct and indirect inhibitory effects of HuIFN-β on human melanoma cells and suggests that local higher concentration of HuIFN-β is needed to eradicate melanoma lesions. This study was supported in part by the Grant-in-Aid for Cancer Research (15–10) from the Ministry of Health, Labor and Welfare of Japan and the Grant-in-Aid for Scientific Research from the Japanese Society for the Promotion of Science, Tokyo. We thank Ryo Ogawa for his excellent technical assistance.